With a stay at the WorldMark Fort Lauderdale - Santa Barbara you’ll experience all the best that this Florida city has to offer. A superb location across the street from renowned Pompano Beach makes this resort a top choice. Paired with stunning views, soothing décor and a wealth of engaging activities, every stay at this resort is memorable. When you buy a WorldMark Fort Lauderdale timeshare you won't want to miss the opportunity to snorkel or scuba dive in the nearby waters, which are also available for parasailing, jet skiing and water skiing. Away from the water, guests can spend the day enjoying one-of-a-kind shopping at the Riverwalk Arts & Entertainment District with its array of stores, restaurants and special events. The whole family can enjoy a visit to the Museum of Discovery & Science where interactive exhibits make learning engaging and fun. With day spas, live entertainment venues and art galleries sprinkled throughout the city, there is always something exciting to anticipate with a trip to South Florida. A stay at the WorldMark Fort Lauderdale - Santa Barbara resort makes for the perfect Florida vacation. The outdoor pool is the perfect place to spend a lazy day lounging in the sun while also enjoying an occasional cooling dip. A hot tub helps soothe away any aches and pains that might arise after a day of golfing or playing tennis. Guests who buy WorldMark Fort Lauderdale timeshare love the schedule of organized activities. That's because the high-energy, fully-engaged staff members make every activity fascinating and fun. From wine and cheese tastings to ballroom dancing lessons and more, the staff at this upscale resort knows how to keep the party going. The lovely accommodations range from a deluxe studio to a two-bedroom suite. Most rooms accommodate up to four adults with ease, however, six guests can be quite comfortable in the two-bedroom suites. Studio accommodations feature a queen bed and a sleeper sofa but all suites have a king-sized bed in the master bedroom. Regardless of which type of accommodation is chosen guests can expect colorful, modern décor and plush accessories. Every detail in these luxurious suites has been carefully considered, from upscale furnishings to elegant linens, so guests can expect a comfortable stay. All accommodations have private balconies, many with breathtaking views of the Intracoastal Waterway. Each room is equipped with a full kitchen to make preparing healthy meals a snap. A private whirlpool tub only adds to the feeling of luxurious indulgence. Life really is better when you vacation in one of these spacious and modern suites. 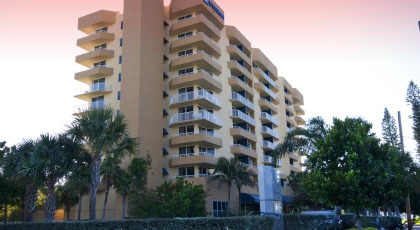 When you buy WorldMark Fort Lauderdale timeshare you're ensuring great vacations at affordable prices. Owning a timeshare at the WorldMark Fort Lauderdale - Santa Barbara is the best way to vacation in style. Contact WorldMark Fort Lauderdale - Santa Barbara Specialist Today!